"There is no abstract art. Between Abstraction and Figuration examines the grey space between figuration and abstraction in contemporary drawing, painting and sculpture. 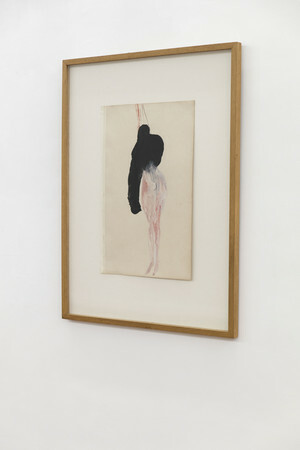 The exhibition features works that occupy the imaginary space between the figurative and the abstract. 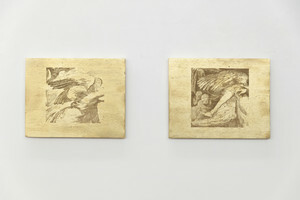 The exhibition features two works by Berlinde De Bruyckere and over twenty works by young emerging artists. 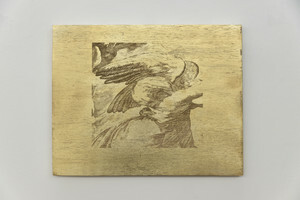 ~~Berlinde De Bruyckere’s early drawings (Parasiet, 1996 and Bloedende Boom 1997-1998) are not preparatory studies for sculptures, but function as works of art in their own right, underlining the themes that together form the leitmotif of her entire oeuvre. Berlinde De Bruyckere deformed trees and human figures symbolise consolation and desolation, protection and danger. They embody archetypical objects and persons, but they also bear the scars and disfigurement left by traumas. They operate as a complex construction, the framework of the age in which we live. 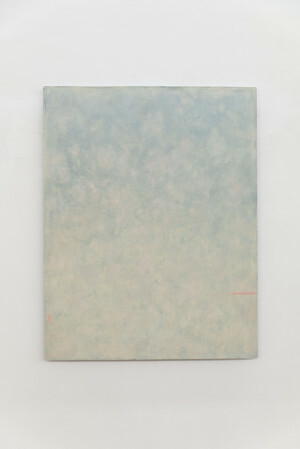 Charlotte Vandenbroucke’s transcendental paintings strength lies in their insistence on ambivalence. With her individual and unconventional adaption of the abstract code, Charlotte creates a pictorial space of seductive emptiness, contrasts between light and dark, lightness (of being) and darkness (of being). 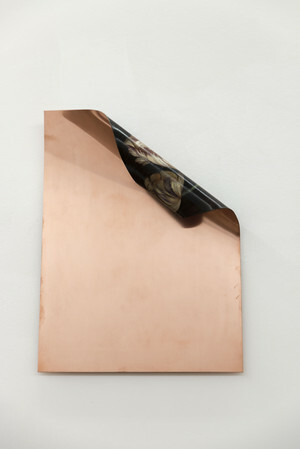 Her paintings radiate warmth and solemnity through subtle gradients and structural manipulations of uncommon surfaces such as metal and marble plates and found objects. Charlotte’s paintings are a subjective response to the cascade of emotions and events that make up life. 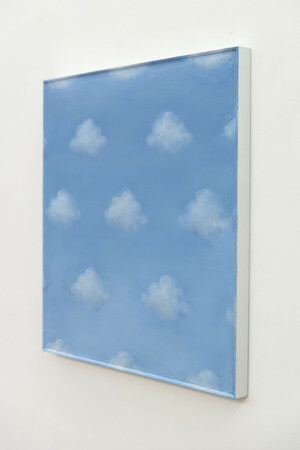 Her paintings operate as poetic distillations of big subjects in which the viewer is always capable of locating himself. 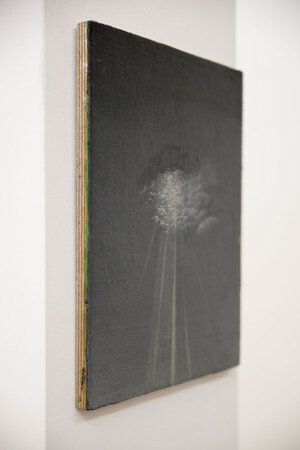 Sarah Smolders’ paintings always refer to site specific moments both in the context of their making as well as their presentation. 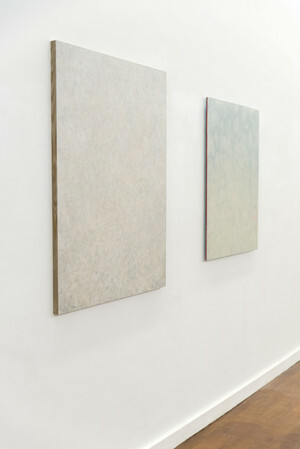 Her research into the qualities and possibilities of paint as material gives form to paintings that balance between the photorealistic and the tactility of the paint itself. 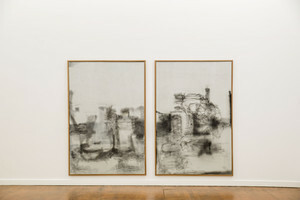 After a work is finished Smolders systematically documents the site, thus preserving a residual image that can be remobilized further on in her practice. An integral aspect of this working process is the continuous re-presentation, reframing, and re-staging of residual images in a new context. 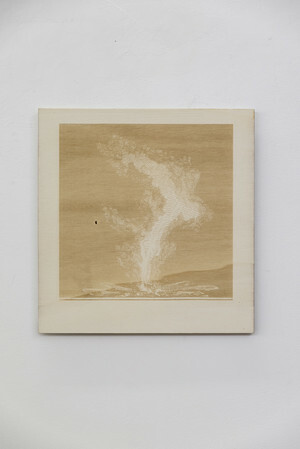 By using this unique approach, Sarah Smolders captures the momentary through suggesting the enduring. 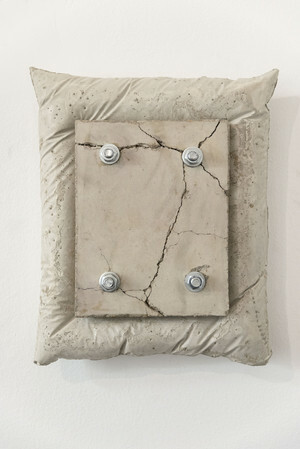 Benjamin Sabatier’s sculptures accomplish an almost impossible transformation of hard materials (concrete, wood metal and bricks) into tender and poetic images. 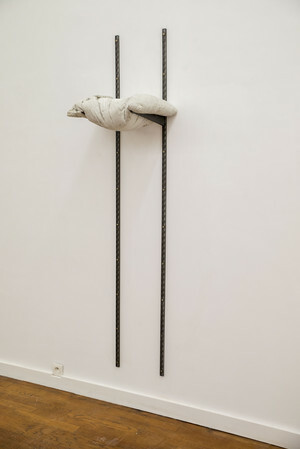 Benjamin Sabatier works investigate sculptural issues such as the relationship between container and content, empty and full, in a tragicomic, yet poetic way. 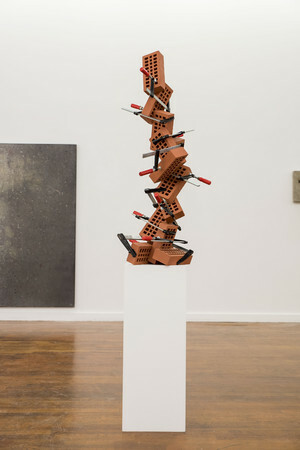 Benjamin Sabatier’s sculptures deal with experiences of alienation, and uncertainty in contemporary life and architecture, but also generate darkly comical moods. Quinten Ingelaere investigates the way classic themes and archetypes of art history installed themselves in our collective memory, how these allegories influence our expectations towards, and the way we perceive contemporary art. He appropriates strategies of 17th century old masters, manipulates them and tries to reduce them to their essence. 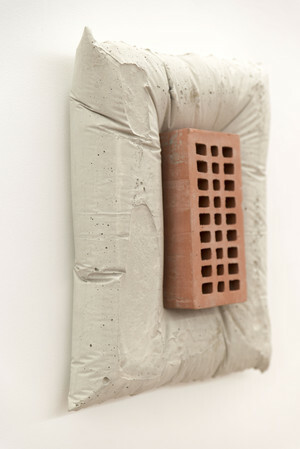 His recent works challenge the duality between abstraction and figuration, sculpture and painting. 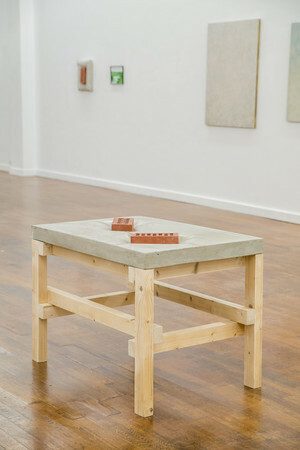 Loïc Van Zeebroek’s paintings, mostly painted on res derelicta (found panels, (roof) tiles...) operate as modest investigations of the essence of painting and the position of a contemporary painter. 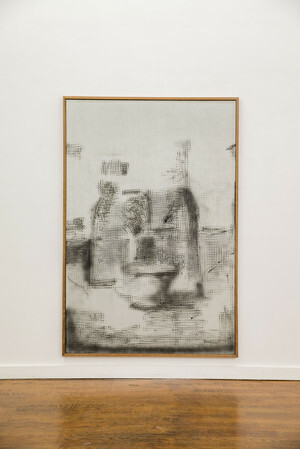 His paintings question the construction of the pictorial image, from figuration to abstraction and vice-versa. 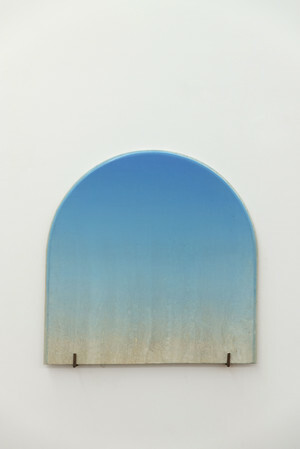 A gradient sky becomes a place for reflection and contemplation. 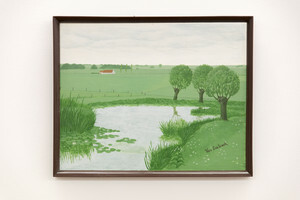 A coloured painting of a field becomes a Color Field painting. A meticulously painted circle becomes a sun and vice-versa. Painting nature becomes the nature of the painting. 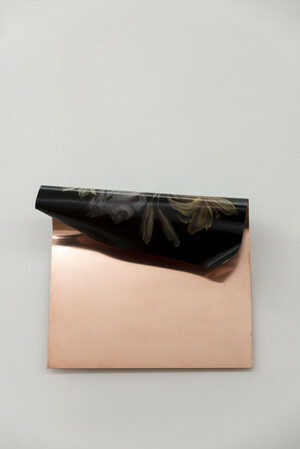 Dauwens & Beernaert is a contemporary art gallery founded by Laurence Dauwens and Joris Beernaert. 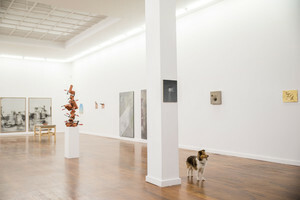 The gallery is located in a former bank building built in 1876. The location has a rich history hosting high profile shows, including artists such as Andy Warhol and Donald Judd. Dauwens & Beernaert's focus is on the primary art market, but the gallery is also active in the secondary market. In the primary sector, the gallery covers a broad spectrum of contemporary artistic practices, from figurative paintings to video work and minimalistic to conceptual work. 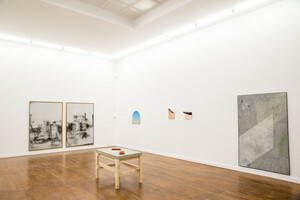 "Welcome, Bienvenue, Wilkommen in het Paradijs"
"D'après Piranesi, diverse manière di adorante i cammini"
Installation view "Roze, roze, roze, tra la la la la " and "Gifwolk in roze"